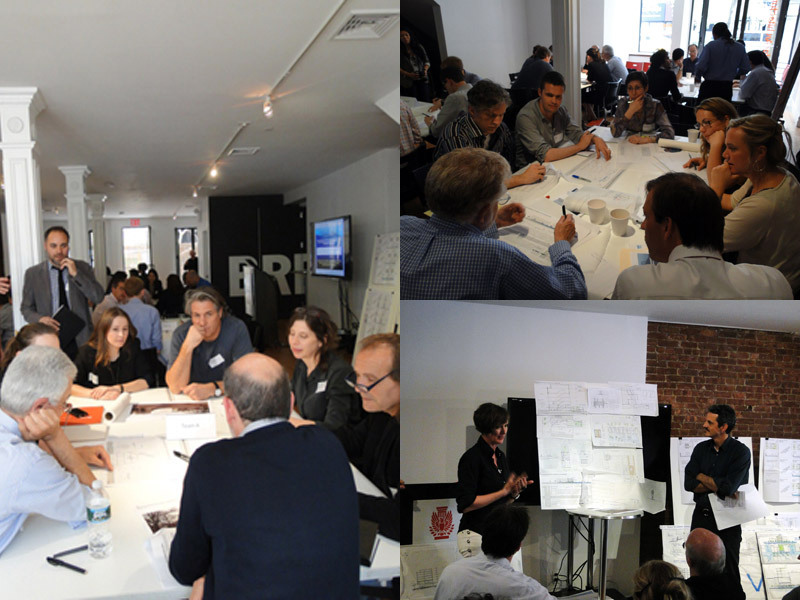 On March 23rd, VisionArc director Landon Brown contributed to the ‘Freeboard’ design charrette sponsored by the New York City Department of City Planning; AIANY Design for Risk and Reconstruction Committee. The day-long event took place at the AIA New York City Center for Architecture. Reporting by Benedict Clouette, writer and the editor of e-Oculus. Recognizing the need for fresh ideas to address these new risks to the city, a recent design charrette at the Center for Architecture brought together more than 50 architects, urban designers, landscape architects, planners, and educators to develop creative responses to the challenges posed by rising water levels and increasingly unpredictable weather patterns. The event, a joint project of the New York City Department of City Planning and the AIANY Design for Risk and Reconstruction Committee, called on designers to propose strategies to improve the city’s flood-resistance while also maintaining the vitality of New York’s streets. The charrette’s participants were divided into groups, each addressing a different building typology (single-family homes, elevator apartments, mixed-use buildings, and multi-family row-houses), and were charged with producing solutions for similar buildings sited in low-lying and flood-prone areas. The brief asked that the designs respond to the anticipated water elevation levels of a 100-year flood, and prompted the teams to keep in mind the pedestrian experience of the street. During the charrette, the participants crowded around tables, sketching their ideas over typical sections and elevations of their building types. Many of the teams produced several possible schemes, reflecting different trade-offs and priorities, all of which were discussed in a round of presentations at the conclusion of the charrette. The afternoon ended with a call to continue to refine the ideas generated at the event, and the suggestion of future workshops to address a greater range of scales, moving from the building to the city and the region. The Department of City Planning is expected to issue a report summarizing the findings of the charrette this summer.